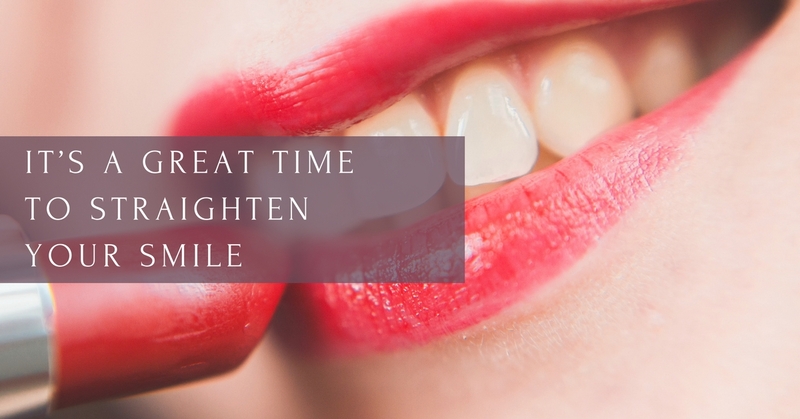 If you have crooked, misaligned teeth, now is a great time to start thinking about getting them straightened. Crooked teeth aren’t just a cosmetic issue. Crooked, misaligned teeth not only affect your looks but also can impact your health and comfort. Misaligned teeth can cause headaches and jaw pain, and when teeth are crooked, plaque build-up can increase, leading to gum disease. An improper bite also means you can’t chew food properly, which may lead to gastrointestinal problems or nutritional deficiency. However, if the thought of wearing metal braces is holding you back from the smile you have always wanted, Invisalign braces may be perfect for you! Invisalign straightens your teeth without using ugly metal brackets and wires. Instead, we use a series of clear, custom-fitting, removable devices called aligners. Not only are Invisalign aligners more comfortable and attractive, they also allow you to clean your teeth more effectively than with traditional braces, and they move your teeth in a much gentler, safer fashion. At Otten Dentistry in Lawrence, Kansas, our expertise in complex bite problems allows us to get far superior results in all our work, but especially with Invisalign! We also offer Accelerated Invisalign for our patients. By combining Dr. Otten’s expertise in Invisalign and the latest in orthodontic technology, we can move teeth more quickly and precisely so that you can achieve your oral health goals in less time. Once the treatment is finished, you’ll be smiling with confidence! In addition to Dr. Otten’s vast knowledge and expertise, Otten Dentistry also employs the newest technology available to treat crooked, misaligned teeth. We now have a new iTero scanner available that allows any of our patients to instantly see how Invisalign can help straighten their smile. The scanner offers 3D high-impact images and works lightning fast, so instead of imaging your Invisalign results, you can see for yourself, right then. Give Otten Dentistry a call, 866-986-5753, send us a message or schedule your FREE scan online to get the smile you deserve!